Welcome to Episode 16 of the Your Brilliant Un-Career Podcast Show! Author of 22 Leadership Fundamentals Alison Vidotto shares how she went from being a mother of six and teacher to the CEO of the family business, a sought-after keynote speaker and trainer in leadership, and the founder of an international charity. Alison’s story is nothing less than inspiring. If you think there are too many barriers to achieving your business goals, this is the episode for you. Make the leap into entrepreneurship, get unstuck and grow! Through Your Brilliant Un-Career, the Podcast, Author and entrepreneur Cas McCullough shares tips and stories to help corporate escapees, wantrapreneurs and entrepreneurs shift from stuck to inspired, from dreamers to doers. Proudly brought to you by the book: Your Brilliant Un-Career: Women, Entrepreneurship, and Making the Leap and the 33 Free business building resources available on the Your Brilliant Un-Career website. Out now on Amazon. 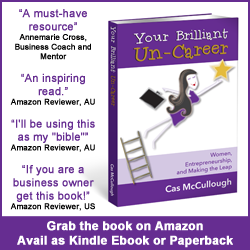 http://bit.ly/uncareerp (Paperback version) http://bit.ly/uncareer (Kindle version). Alison Vidotto is a mother of six, published author, professional speaker, CEO of Vidotto Group, Founder and Managing director of the Australian Charity for the Children of Vietnam, qualified ESL teacher, trainer, and business owner. Alison has a passion for leadership and development, both within herself and in others. Alison set up her first small business in 1992 and found many of the same challenges business owners experience today. Having worked through the Australian 1992 recession, the Global Financial Crisis and Brisbane’s 2011 floods, Alison has developed a real world understanding of potential hardships businesses face and the need for strategic planning to survive and grow through tough times. Working with family presents challenges but it pays to roll with it. The number one thing is to have respect for one another. There are lots of positives to having a family-owned business. You can phone a family member anytime and you know each other really well. We are all capable of being great leaders. You don’t need to be a billionaire or CEO. Leadership is stereotyped, so people can often think “I’m not a leader,” but if you run a business…. guess what, you have to lead. That doesn’t mean be bossy and authoritarian. Be an authentic leader. You have a responsibility to your family, customers, and the community at large. If you’re a great leader at work and not at home, you lack self-leadership. You can take the easy way out or you can make the tough calls and get the results you’re after. The buck stops with you if you are a business owner. Leadership is about coming up from behind and empowering other leaders. When you empower the people around you it makes your life a whole lot easier because it makes it easier to delegate. Plant a seed for a tree that you will never sit under. Alison recommends: Read the E-Myth (Michael Gerber). Alison’s book: 22 Leadership Fundamentals. Chapter 3 of Your Brilliant Un-Career talks about putting systems and processes in place for your business. I have done a terrific interview with Alison on this topic. You can access that for free here, along with 32 other business building podcast interviews, templates, worksheets and motivational affirmation.